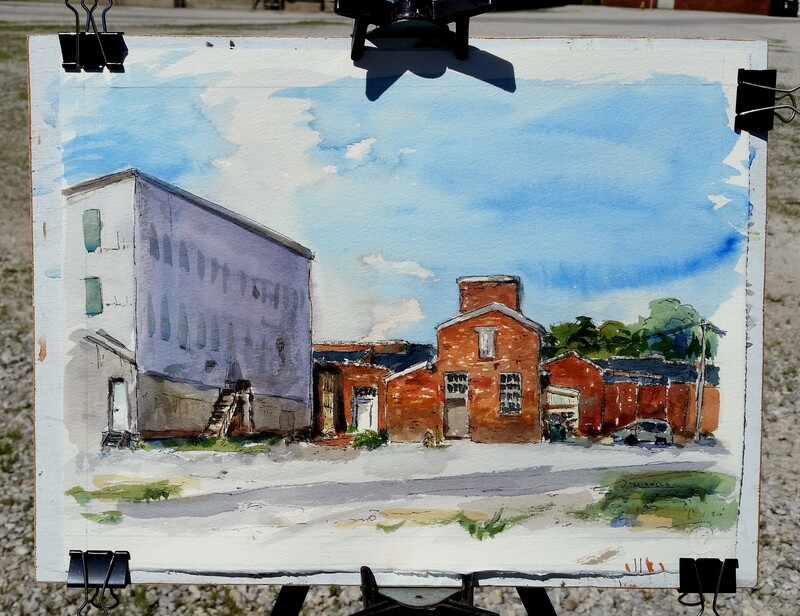 Today I decided to paint this old factory building. It has undergone so many renovations and additions over the years. Very interesting from many aspects. I selected this broad scene (and it really could have been a panorama if I had brought larger paper with me). I may end up doing some close-ups of the interesting architecture over the coming months. Today’s challenge was to work with some speed in order to beat the changing position of the sun and the shadows. This is why so many artists like to paint on cloudy days. I don’t so I just have to paint quickly or remember where I want to keep the sun and shadows even as they move. This entry was posted in pen and ink, plein air, plein air painting and tagged art, kit miracle, painting, pen and ink, watercolor. Bookmark the permalink.